Hosting family and friends over the festive season can be intimidating and exhausting, but good planning can make the process smoother. There are a few steps you can follow to make the party planning process easier. We break down everything you’ll need to do in order to plan your perfect party this festive season, whether it’s a family Christmas function or a New Year’s Eve extravaganza. The theme – A theme does not have to mean costumes, but having a universal colour palette for your party will help to create the perfect party atmosphere. Who are you inviting? – If children will be coming, you need to accommodate for their tastes and entertainment. Have child appropriate movies on hand and maybe a separate table for the children to eat at. The menu – Are you organising a sit-down meal or will it be canapes and finger foods? And don’t forget to include vegetarian and vegan options for those who don’t eat meat. Buy everything in advance – If the food and décor you are planning to have can be bought ahead of time, this will ensure you don’t struggle to find what you need in a last-minute dash to the shops. While everything you have to achieve could be overwhelming, creating a check list is a great way to keep on top of it all, and you will also enjoy a sense of accomplishment when you check things off the list. The colour of the season is gold, adding elegance and sparkle to your Christmas. There are great offers on Christmas décor, from baubles for the Christmas tree and garlands to adorn the house, to tableware and napkins. Pick a theme and let it run through all your décor to create maximum impact and wow your guests. And don’t just keep the decorations for the tree. There are gorgeous lights and garlands on offer that will add extra pizazz to your festive decorating so your party will sparkle with style. When it comes to decorating your table, you don’t want to go overboard so people can’t see each other, and your food gets lost in the decorations. Keep it simple and elegant, with small decorations that will add festive spirit to your table without overshadowing the food, which should be the real star of your Christmas table. And when dressing your table, don’t forget the Christmas crackers. There is a broad selection on offer in a range of stores, so you’ll certainly find beautiful festive Christmas crackers to match your colour scheme and your budget. Another item not to forget when layout out your table and the food is napkins. 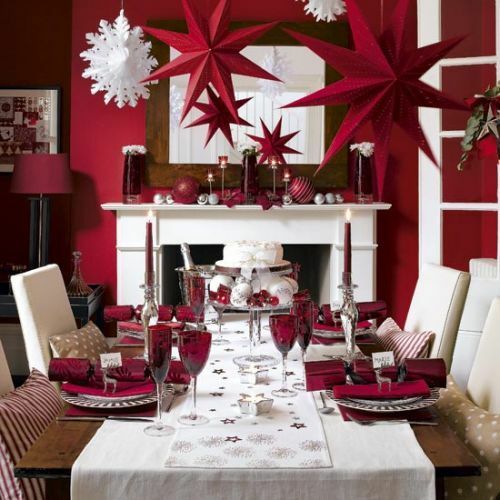 There are different festive designs on offer, or go for something simple in plain colour to match your décor. And what Christmas or New Year’s Eve party would be complete without enduring seasonal favourites like mince pies, or toasting in the New Year with a glass of Prosecco?